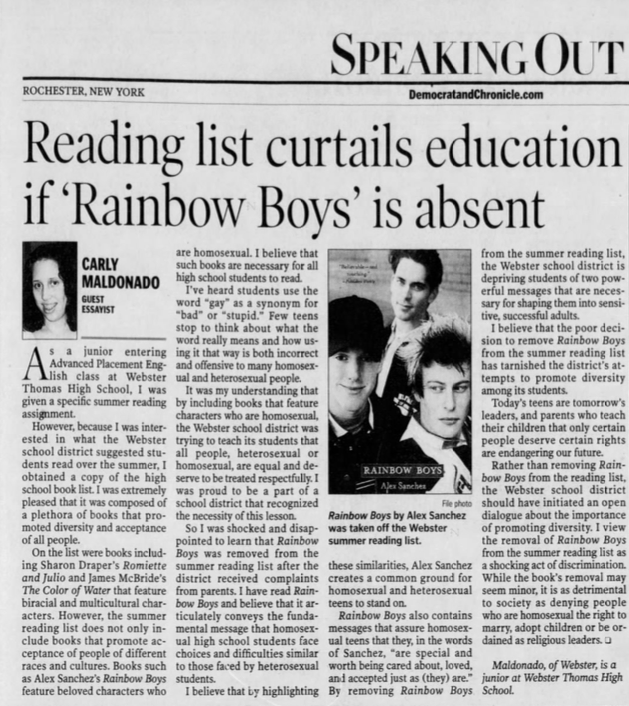 Carly Maldonado, a Webster High School student, writes an op-ed for the Democrat and Chronicle calling for Rainbow Boys to be returned to the list. 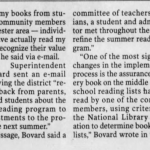 (September 7, 2006) — As a junior entering Advanced Placement English class at Webster Thomas High School, I was given a specific summer reading assignment. 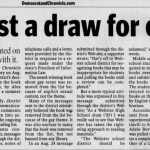 However, because I was interested in what the Webster school district suggested students read over the summer, I obtained a copy of the high school book list. I was extremely pleased that it was composed of a plethora of books that promoted diversity and acceptance of all people. On the list were books including Sharon Draper’s Romiette and Julio and James McBride’s The Color of Water that feature biracial and multicultural characters. However, the summer reading list does not only include books that promote acceptance of people of different races and cultures. Books such as Alex Sanchez’s Rainbow Boys feature beloved characters who are homosexual. I believe that such books are necessary for all high school students to read. I’ve heard students use the word “gay” as a synonym for “bad” or “stupid.” Few teens stop to think about what the word really means and how using it that way is both incorrect and offensive to many homosexual and heterosexual people. 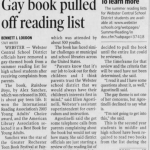 It was my understanding that by including books that feature characters who are homosexual, the Webster school district was trying to teach its students that all people, heterosexual or homosexual, are equal and deserve to be treated respectfully. 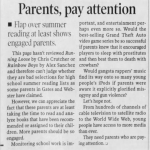 I was proud to be a part of a school district that recognized the necessity of this lesson. 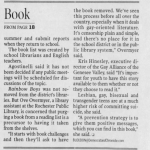 So I was shocked and disappointed to learn that Rainbow Boys was removed from the summer reading list after the district received complaints from parents. I have read Rainbow Boys and believe that it articulately conveys the fundamental message that homosexual high school students face choices and difficulties similar to those faced by heterosexual students. I believe that by highlighting these similarities, Alex Sanchez creates a common ground for homosexual and heterosexual teens to stand on. 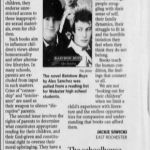 Rainbow Boys also contains messages that assure homosexual teens that they, in the words of Sanchez, “are special and worth being cared about, loved, and accepted just as (they) are.” By removing Rainbow Boys from the summer reading list, the Webster school district is depriving students of two powerful messages that are necessary for shaping them into sensitive, successful adults. 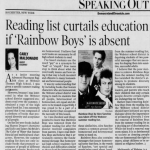 I believe that the poor decision to remove Rainbow Boys from the summer reading list has tarnished the district’s attempts to promote diversity among its students. Today’s teens are tomorrow’s leaders, and parents who teach their children that only certain people deserve certain rights are endangering our future. 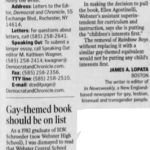 Rather than removing Rainbow Boys from the reading list, the Webster school district should have initiated an open dialogue about the importance of promoting diversity. 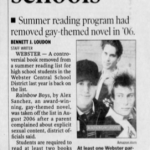 I view the removal of Rainbow Boys from the summer reading list as a shocking act of discrimination. While the book’s removal may seem minor, it is as detrimental to society as denying people who are homosexual the right to marry, adopt children or be ordained as religious leaders. Maldonado, of Webster, is a junior at Webster Thomas High School.